Recently, Deena Skolnick Weisberg, a senior fellow in the department of psychology at the University of Pennsylvania, wrote an interesting article titled “Why kids can learn more from tales of fantasy than realism.” The article reminded me of some work I’ve done recently in looking at the role of fantasy in learning and why fantasy is not just a learning technique for kids but for adults as well. So here is a look at some research I’ve done and a recap of the findings from Deena Skolnick Weisberg. Why include a fantasy element in the design of learning games for adults. The use of fantasy can be a purposeful and meaningful design decision which can have a direct positive impact on learning. In fact, research indicates that fantasy provides cognitive emotional and motivational advantages for learning (Malone, 1981). With fantasy, feedback is conveyed in a safe environment with specific, but not catastrophic, consequences for failure. The fantasy of dealing with say a zombie means that failure and experimentation are allowed and encouraged. Humans learn from failure more than instant success. The fantasy environment allows for failure and re-engagement with the content again and again which leads to mastery. 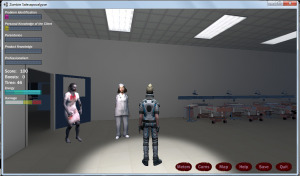 We also know that if a simulation provides the same cognitive activities as the real-life situation, the skills are transferable to the actual in-the-field situation. 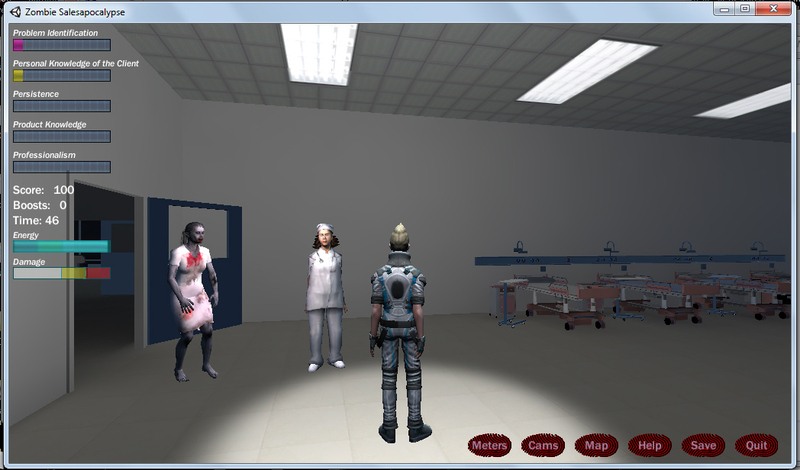 In a game with Zombies teaching a sales model, the exact sales model that is used in the field can be used in the game. The different environment (zombie infested lab) actually helps with generalizing of the knowledge and creates, in the mind of the learner, a set of heuristics to deal with sales situation rather than creating a rigid set of algorithms that are difficult to generalize. In terms of emotional impact, fantasy provokes vivid images related to the material being learned, thus improving the learner’s memory of the material. Emotionally, fantasy also helps to break down the defenses of a learner. When confronted with many sales situations, the learner may feel he or she is already well versed in their subject viewing the training process as a waste of time. Fantasy helps to break down that resistance because the environment is new, novel and different. The learner doesn’t know how to deal with zombies or the new environment; it makes them more open to exploring the learning environment and less defensive (Lepper, 1988; Malone, 1981). Finally, fantasy in games can be highly motivational. While not everyone loves to play games, a large portion of most populations like to play games and enjoy the opportunity to gain mastery of the game environment. Fantasy in games provide an immersive learning environment because they require continual vigilance, provide constant feedback, correct incorrect activities and reinforce correct performance which eventually leads to mastery of content. This is not really surprising given the work of Malone and Lepper but it does seem to fly in the face of conventional wisdom which is to make learning as realistic as possible. But perhaps fantasy of children, and adults, plays a more powerful learning role than we know. One that helps us transition from unknown to known. … something about fantastical contexts…is particularly helpful for learning. From this perspective, fantastical fiction might do something more than hold children’s interest better than realistic fiction. Rather, immersion in a scenario where they need to think about impossible events might engage children’s deeper processing, precisely because they can’t treat these scenarios as they would every other scenario that they encounter in reality. Cognitively, the children have to work harder to learn the information because there are few familiar contexts. Could it be the same for adults? I would argue, yes. Fantasy can provide the right environment and cognitive triggers to cause adults to think more deeply and richly about subject matter because it is foreign and requires more processing. It is a fascinating area of study and these studies strongly suggest that a health dose of fantasy might just facilitate learning more richly than realistic case studies. Lepper, M. R. (1988) Motivational considerations in the study of instruction. Cognition and Instruction. 5(4), 289-309. Weisberg, D. S., Ilgazb, H., Hirsh-Pasekc, K., Golinkoffd, R., Nicolopouloue, A., Dickinsonf, D. K., 2015) Shovels and swords: How realistic and fantastical themes affect children’s word learning. Cognitive Development. Volume 35, July–September 2015, Pages 1–14.